We have a wide variety of Notary Products to fit your every need. 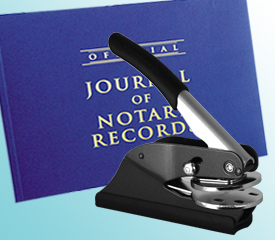 From stamps to journals We have a one stop shop for all your Notary needs. Choose from any of our different stamp mounts. We have the Xstamper Pre-Inked, ClassiX or XstamperVX all durable and dependable. ClassiX by Xstamper metal desk and pocket embossers have been engineered to produce higher pressure with minimal effort. Our Seal Highlighter (see embossers) is pre-inked with black ink and a flat impression area sized to match our round seal embossers. When pressed lightly over an embossed impression, it darkens the raised areas for increased readability. Protect yourself by making a detailed record of your official acts as a notary in our notary journal. This 141-page book has ample space for detailed records and thumb prints for over 500 entries.